When you know you are going to be working with fellow wedding vendors that you completely trust and admire, you know it will be a great wedding day. Tiff & Mike's wedding was just that. Not only are Tiff & Mike personal friends, but I have gotten to witness their love story unfold over the last several years. It was such an honor to be asked to photograph their proposal, their engagement session and then of course their beautiful wedding day. 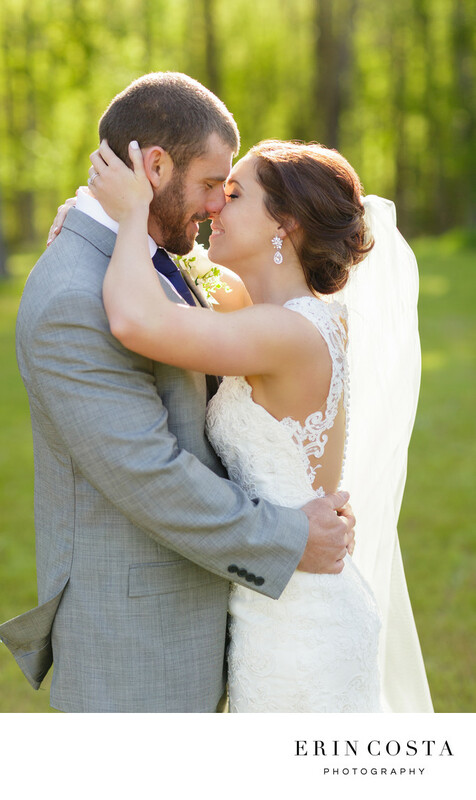 This is one of my favorite photos from Tiff & Mike's wedding at the Barn at Rock Creek. The way the sun is coming through the trees and highlighting them is one of my favorite ways to photograph couples. This particular photo was featured on the Huffington Post as a real wedding photo that will put some spring in your step. The Barn at Rock Creek is one of my all time favorite venues in the Wilmington area. With the gorgeous property surrounded by trees paired with the modern barn, it's the perfect venue for anyone searching for a rustic yet modern vibe for their wedding. Lesley is possibly the sweetest person in the world, and will go out of her way to make sure your wedding day is perfect!